Each cruise is different. River cruises, lake cruises, sea cruises, ocean cruises: all they are divided by the number of stars, the quality of cruise ships, conditions, terms, accommodation options and directions. For Russia cruise is still an exotic form of tourism. Even such a seemingly standard product like a Mediterranean cruise is something exceptional. It is similar to the honeymoon, which you can afford once in a lifetime. At the same time, today there are dozens of budget options, including the Mediterranean, the Baltic Sea and other popular destinations. But few people know about them. Portal www.cruise-profi.com is a resource that presents detailed information about cruises. 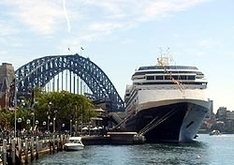 On the pages of the portal you can find detailed information about the features and capabilities of cruise travels. One of the main advantages of www.cruise-profi.ru is booking of cruises online without travel agencies. Portal www.cruise-profi.ru aims to familiarize users with an extensive and interesting world of cruise travels. We want to make booking of cruises easy and affordable already now. Cruises is a huge multi-million dollar industry. A cruise may mean spending a month on a small river steamboat, relaxing on the board of a luxury liner, or an extreme trip on an icebreaker. Today there are even cruises to the North Pole. In any case, classic cruises are always in demand. It means luxury, elegance, gold, club jazz, elegant waiters and pools on the deck. Such cruises usually last more than a month. A separate niche, which is now being actively developed, is river cruises. In this respect Russia with competent organization in the near future can become a leader in this field. Having already become classic cruises on the Volga River and the cities of the Golden Ring can be complemented by cruises along the route "From the Vikings to the Greeks" and new cruise programs on the Siberian rivers. Foreign river cruises are mainly presented by cruises on the Nile, the Danube and the Rhine. During the past 20 years cruise format began to change. If earlier the average duration of the cruise was one month, today it dropped to one or two weeks. Thus, cruises are now affordable for middle-class tourists. Each cruise has its own type of vessel. The ship, which is designed for a cruise on the Lake Onega will be smaller in size and range and have shorter list of services than the liner, which operates on Mediterranean cruises. But these differences are not always obvious for the ordinary traveler.